This access is associated with the early Clarence Dutton geological exploration as are some of the other old trails from the northside. The location of this access, originating from prospecting activities as early as 1872, shows on the Dutton geologic survey from this period. The place-name Surprise Valley (name origin) also appears on the Dutton survey. Reports are that this was once a seasonal cattle trail, but stock access to this area in recent history is more likely associated with Big Saddle and Little Saddle. Although a reasonable access through the Coconino at what might otherwise seem an improbable location, there is little sign of a trail here today. Identifying this location as a descent from the rim would be quite difficult as the even grade and vegetation of the slope gives no hint whatsoever looking downslope. From below, the idea of getting up through the Coconino at about the midpoint of the arc of the rim between Crazy Jug and Monument Point appears reasonable if not obvious (photo). Once you have been through the cliffs at least once there should be no trouble choosing a good line. Bridgers Knoll  approaching from the west you may find the remains of the old fence that once marked the western boundary of Grand Canyon National Park along a line with Bridgers Knoll and Monument Point (photo). Big Saddle Camp  approaching from the east, this was another horse-trail access from the rim to the Esplanade. There is considerable cryptobiotic soil along the Esplanade so be careful where you walk. It is possible to stay on the firm soil of a deer track or follow drainage lines or on solid rock for much of the time. 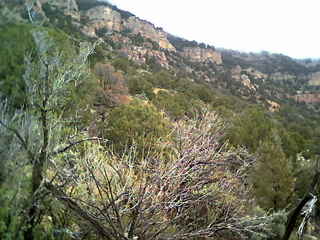 The Coconino is clearly broken up here, but the access through the main band of the cliff is just one place. The main difficulty is that the lower slope is divided by a series of ridges and ravines. The important decision is choosing the correct ridge to go up to the base of the cliff and not to be going across from ridge to ridge. Look for the largest ridge mapped in the 6200 ft contour projecting to the southwest  the principle drainage of this slope is marked in blue next to the ridge, and this ridge is actually a small hill with a saddle to the slope above. Ascend from anywhere below this ridge and up to the saddle. 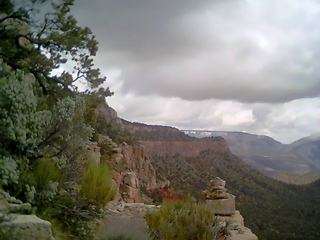 Then contour west into the drainage and up to the west of a prominent cliff with a large cairn mounted on the top of the point (photo)  this rockpile is so large it seems at first it might be a natural feature. It should be very clear that you are on a track that has seen some travel, and even some places where a trailbed may have been constructed. From above the point contour east and then up through the next break in the cliff which is also quite steep. 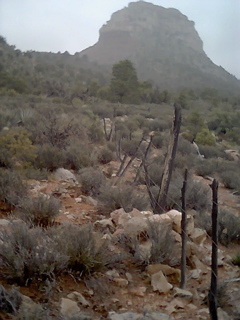 There is no hope to find any track ascending through the Toroweap and Kaibab rubble, but there can be a few trail markers. Anyway, just follow whatever seems the best line until the slope rolls off and you come out on top  the road follows fairly close to the rim here. Almost nothing remains of the original trail and this is now an off-trail route. A steel soda can in a trash pile and an old fire ring under a ledge show that the place once had considerable regular use and not so very long ago. The main usefulness of this route is for a way up from the Esplanade for a loop from Big Saddle or even from Swamp Point, or coming out from the Redwall access up from Tapeats and Crazy Jug fork.